Claudia Serea’s poems and translations have appeared in Field, New Letters, 5 a.m., Meridian, Word Riot, Apple Valley Review, and many others. A seven-time Pushcart Prize and four-time Best of the Net nominee, she is the author of Angels & Beasts (Phoenicia Publishing, Canada, 2012), A Dirt Road Hangs From the Sky (8th House Publishing, Canada, 2013), To Part Is to Die a Little (Cervena Barva Press, 2015), and Nothing Important Happened Today (Broadstone Books, 2016). Serea co-hosts The Williams Readings poetry series in Rutherford, N.J. She is a founding editor of National Translation Month. More at cserea.tumblr.com. If the poet had left out most of the opening couplet and started with “Maria, leave the boiling pot/ unattended,” the poem would have just one speaker: God. 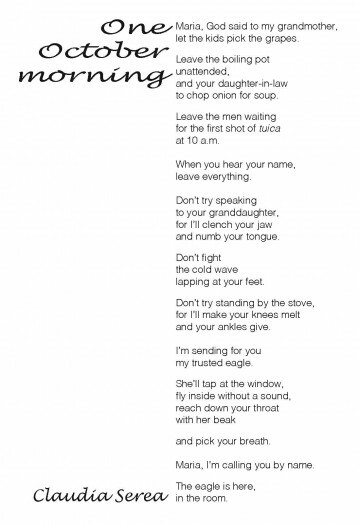 (Who else would say “I’m sending for you/ my trusted eagle… [to] pick your breath”?) The presence of Maria’s granddaughter, though, complicates the story; she’s grappling with her grandmother’s stroke by imagining it as a spiritual encounter from God’s perspective. It’s a bold move on the part of the poet that requires delicate control. To be credible, the voice of God must be commanding, the exercise of power fearsome but not arbitrary. To keep the reader grounded, the images must balance the divine with an equal measure of the mundane. What’s especially poignant is the poet’s choice to end without returning to the granddaughter’s voice. The poem ends with God’s eagle, and the silence that follows is both the granddaughter’s and the reader’s. The typefaces for the body and title need to be just as divergent from each other as Maria’s interior experience is from what an outsider might see. Helvetica is consistently clear, evenly weighted, and so easy to read that it recedes into the background, lets the phantasm of Maria’s experience provide the necessary flourishes. Lucida Handwriting is heavier and a little stretched, each letterform reaching for the next as if to say, “don’t leave me,” an unspoken sentiment that nonetheless pervades the poem.